With a shaft of winter sun through the branches of a decidous tree the Winter Aconites glow gold and bright yellow. The low level of the sun catches the flowers and opens the simple petals to flash the stamens at the early insects. In the wild Aconites do exactly what bulbs are supposed to do they grow, flower and seed while light penetrates the bare branches of the trees above them. Winter aconites grow only 3 inches high and have upturned yellow cup shaped flowers around 1 inch across. The flowers sit stalkless on a ruff of bright green leaves and they can flower for up to six weeks. A member of the buttercup family the leaves are deeply cut and disappear back into the soil by May. 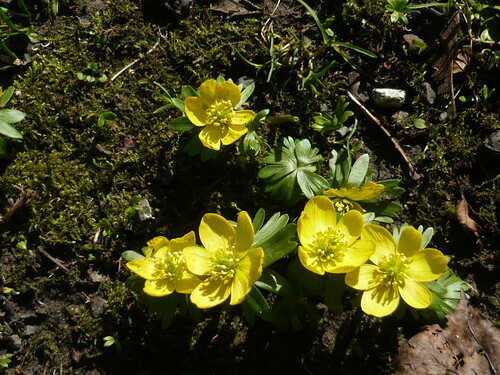 Winter Aconite tubers hate drying out so they need to be planted or transplanted “in the green”, while the foliage is still fresh and the plants are in active growth. The tuberous Winter Aconite like a loose, well-drained chalky soil but will naturalise in a lawn or under a deciduous tree. The knobbly tubers need to be planted 2” deep and can be divided after flowering every few years. However they dry out very easily, dislike being moved and are best left to their own devices. 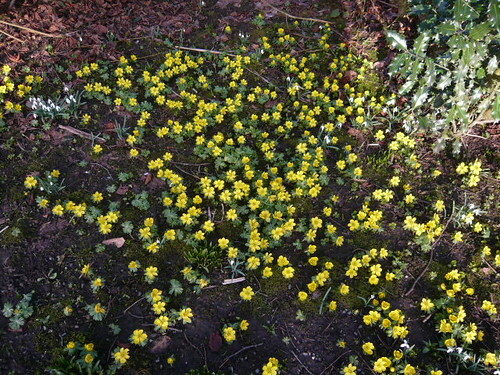 Winter aconites are OK in containers as long as they get water and winter sunshine but that is not their best location. If buying bulbs/tubers go for those sold ‘in the green’.